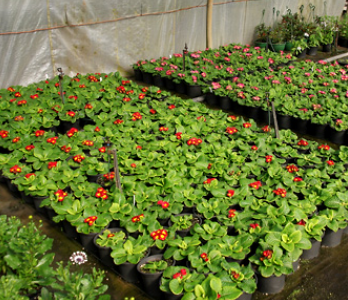 Haifa Multicote™ products were chosen to provide the plant nutrition solution to the nursery. “We use a combination of the Multicote™ (8)15-7-15+2MgO+ME and Multicote™ (2) 42-0-0” said Mr. Johan Retief, Malmesbury Groothandel Kwekery CEO. “The Haifa Multicote™ products provide us with a huge saving on our annual fertilizer account. 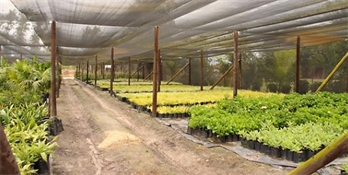 Due to the controlled release fertilizers all the plants grow very evenly. Having an 8 month release also saves on the labour as it is only applied once per season, and reduces fertilizer wastage”. At the nursery we mix 50kg Multicote™ (8) 15-7-15+2MgO+ME and 20kg Multicote™ (2) 42-0-0 together. After mixing the Multicote™ products we apply 7g of the blend per litre of growing medium and mix it together with the growing medium in a concrete mixer. For the older plants, such as trees and shrubs which spend 2 or more seasons in the nursery we re-apply the Multicote™ blend at 5g per litre of growing medium. The nursery team make 3 holes around the base of each plant’s stem, about 5cm from the stem, using a teflon peg, dividing the dosage evenly into each hole.